Paul 'Grumpy' Watson has had a long drag racing career and is one of very few people to win a drag racing Championship on a bike and in a car. 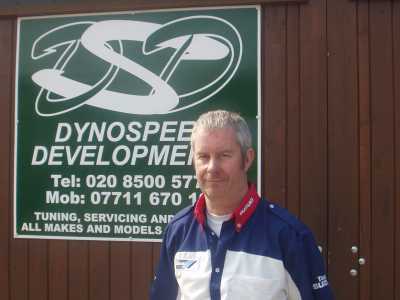 He has for the last four years been proprietor of DynoSpeed Developments, based in Chigwell. 2007 will see Paul as Team Manager of the Lethal Zephyr Pro Modified team with driver Ray White at the wheel. We spoke to Paul at the DynoSpeed Developments shop in March 2007, a week before the Autotrader Easter Thunderball at Santa Pod Raceway. Eurodragster.com: How did you start in drag racing? Paul Watson: My first race was at Blackbushe in 1977 in the Street Class, I was in a V6-engined Viva, up against Dave Mingay. Eurodragster.com: Tell us about your racing history. Paul Watson: I raced on and off for years including Run What Ya Brungs and race meetings. In the mid to late 1980s I was running the Street Class still but in a Pop, first powered by a four cylinder motor then by the end of the decade a 302 cu in motor out of a Mustang. Eurodragster.com: When did you switch to Super Gas? Paul Watson: After I ran Street, in around 1990, I bought a Dodge Dart, originally built by Steve Rawlings and another guy, which needed some work. So I did a complete rebuild, with help from Jon Webster on the chassis and Rob Loaring with whom I designed the motor build. First off, the car was red but later Mark Gredzinski designed a new paint scheme and the car was named Grumpy's Gasser. With this I won the 1991 and 1992 BNDRA Super Gas Championship. I was really proud of that achievement because it was at a stage where Super Gas was ultra-competitive. Eurodragster.com: You then had a period of crewing for teams? Paul Watson: I sold Grumpy's Gasser in 1996 and crewed with John Ellis on the C&S Calibra. John bought it from Dave Mingay and Ray White and I helped rebuild it to the Pro Mod specs of the day. I also got interested in bikes around this time and passed my bike test. After this I had to buy a Suzuki Bandit, which I then thought 'it would be fun to take up the track'. 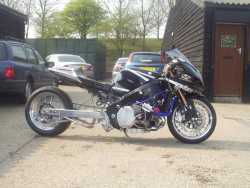 Eurodragster.com: So how did you get on with your bike? Paul Watson: In my first year out in 2001 I won the 9.90 bike championship with the 'Grumpy's Bandit' bike. The whole championship was actually a dice between Jamie Sneddon and I - I won four events and Jamie won three. Then in 2002 I wanted to go faster. I thought 'let's see what it's like to go eight seconds'. So I added a 100 hp nitrous kit to the 1216cc Bandit engine (which already made 150 hp) and managed to run 8.7s with a 60ft time of 1.38. I was still able to ride this bike on the road, which was more than I could say for many of my competitors at the time, let alone now. 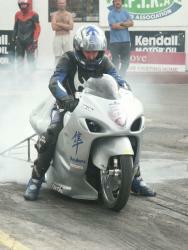 Eurodragster.com: When did you move up to Pro Stock Bike? Paul Watson: At the end of 2002 I bought Al Cook's Pro Stock Bike. I felt I had to move up a class because to be competitive in Super Street I would have had to step the bike up in a major way and it wouldn't have been worth it. I spent the close season preparing it and ended up finishing third in the Championship in 2003. In the following year I had to miss a couple of races at the start of the season and that hurt my chances and I came third again. After taking 2005 off, 2006 was my final season. I started by attending Frank Hawley's drag racing school for Pro Stock Bike riders which was superb as George Bryce and Chip Ellis were there as instructors and Angelle Sampey and Antron Brown were also attending on behalf of the Army team. I learnt a lot about racing psychology and confirmed what I had already learnt about not letting your focus be distracted during any part of the race weekend. In 2006 I had yet another third place in the Championship after some back problems and also raced in Europe with the Motospeed team. Mantorp Park was incredible – I couldn't believe how steep an uphill incline there was. When, on my third run, I came off the throttle too late, I thought I was going to be well into the gravel but stopped only a couple of inches in and the marshals applauded me. The highlight of 2006 was my win at Hockenheim over the first ever European sixteen-bike Pro Stock field, which is definitely my best win ever. The European Pro Stock bike racers are a great bunch. I've been out to Italy a few times to Luigi Chinarello, who also has a Dynojet 250 dyno, and he still owes me a meal after a bet over whether he would run faster than a 7.8 with my tuning advice (Ed: Luigi ran a 7.6). Those guys really know how to dine after a day at the track. 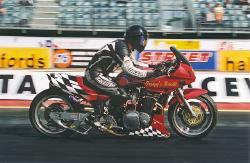 Eurodragster.com: When did you start DynoSpeed Developments and what products and services does DSD offer for bike racers? Paul Watson: I bought the business from Brad O'Connor in 2003 and work on my own. The main part of the business is running bike dyno tests on my Dynojet 250 equipment that has rolling road and brake facilities and I am an Authorised Tuning Centre for Dynojet. The vast majority of work is for circuit racers but there is a little drag racing work. I use a Power Commander ECU to set up the fuel and ignition across the complete rev range at 500rpm intervals and for eight throttle settings. For the future I would like to place the dyno inside the main workshop with extractor fans and upgrade it to use it for cars. The equipment can take up to 1000hp. Eurodragster.com: Who are the 'DSD Riders' and what support do you give to them? Paul Watson: Last year, I helped Julian 'Fast Harry' Harris who runs a Bandit and he got down to a 9.2 with no gas and should run a mid-eight with gas – he's dialled the clutch in really well on that machine. I also gave Andy Haley my support in 2006 on his Hayabusa. These two guys could be in with a chance of the 9.50 Championship this year as they understand where they need to be and have both the determination and equipment to succeed in a really competitive class. Eurodragster.com: What projects are you currently working on? 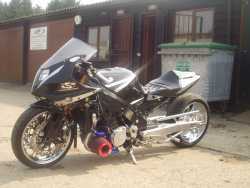 Paul Watson: DSD is supporting Mark Watkins' Super Street GSXR, which Mark has been building here at DSD. It's got a turbocharged motor pushing out in excess of 600hp and Hayabusa box (the stock ones are pretty strong). Should be enough to run a seven. 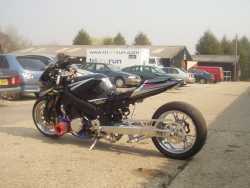 Eurodragster.com: What do you think of Super Street Bike's current state and whom do you tip for the Championship? Paul Watson: It's probably reached the stage where you need to spend between £15,000 and £20,000 to be competitive. For that amount of money you could buy my Pro Stock Bike, so it's no longer a class that you can run a 9.50 bike with a nitrous kit or turbo bolted on. Some of the bikes this year will have both and will also have suspension set-ups that make them impossible to ride on the street, which is a bit against the original concept of the class. Then there's the ECU and whether it is providing traction control, which it can if the correct channels are engaged. But I'll leave it to the scrutineers to sort that one out. It's going to be mighty competitive this year. Jamie Sneddon, for whom I was crew chief in 2005, has the potential to run a 7.3 with the Honda Blackbird and now Steve Venables has upped the ante by importing Barry Henson's Hayabusa, which has run 7.25, from the States. A lot of the other riders will be running slider clutches which are really important for consistent launches. My 'dark horse' bet is Nigel Barker who has a new nitrous system. And then there's Graham Balchin, who tuned Steve Venables' Kawasaki ZX12 for the last three years and now has that bike, which can run 7.5s. 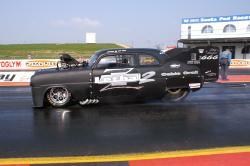 Eurodragster.com: Tell us about your involvement as Team Manager with Ray White's Lethal Zephyr Pro Mod car? Paul Watson: I've known Ray since 1988 and worked with him on John Ellis's Pro Mod. I greatly admire Ray's efforts in building the Lethal Zephyr Pro Mod in his garage at home with chassis design help from Andy Robinson. Over the winter, the motor has been reworked and a Kobelco Superman blower fitted, with mods necessary to the scuttle and screen areas. Eurodragster.com: What are your racing goals for 2007? Paul Watson: With the team's current finances it is going to be hard to run for the championship so we want to improve the performance to a 6.6s or thereabouts and to be safe and competitive. On the back of that we would like to do a deal with a major sponsor who can help us with finance for the European tour in 2008. Eurodragster.com: What are your objectives for the Easter Thunderball? Paul Watson: We need to make a couple of clean passes and show improvement run-by-run. We have a new combination and will be at the Peak Performance day to set the fuel system up. The car needs to launch harder so our performance measures will mainly be to the sixty-foot and the eighth. Eurodragster.com: Who is on the Lethal Zephyr team and what are their roles? Paul Watson: The crew are all old friends from the Super Gas days: Big Steve Dowler who is Crew Chief, Little Steve, Geoff, Big Chris (our clutch man), Jackie (Ray's wife) and a couple of part time members. There is a great atmosphere. Eurodragster.com: Which award are you proudest of and why? Paul Watson: I am really proud of the SPRC James Edgar Memorial Trophy for best Crew Chief: to be in company with other winners such as Alan Jackson, Jeff Bull, Crunch and Luke Robinson is very special. 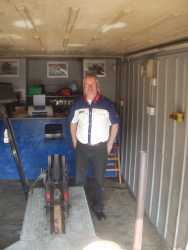 Eurodragster.com: Thank you for your time Paul, and all the best for a successful 2007 season.